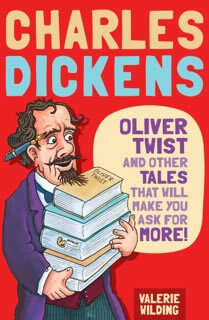 Charles Dickens - Oliver Twist and other tales that will make you ask for more! This was a labour of love, as I’m a huge Charles Dickens fan. I do hope he would have approved of the way I’ve retold his stories. You’ve heard of Oliver Twist – now you can join the manhunt for Bill Sikes with the Crimes R Us TV crew. Or you can read the Christmas Carol ghosts’ X-Mas Files as they sort out Scrooge. Maybe you’d like to follow the police investigation into the goings-on at The Old Curiosity Shop? 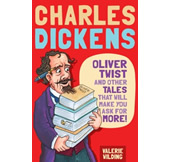 There are ten of Dickens’ best novels retold here and after each retelling there’s a fact section giving readers the lowdown on crime, nasty schools, the workhouse and many other aspects of Victorian life. My hope is that readers will find them such fun that one day, when they come across the real thing, they’ll remember Oliver Twist And Other Tales and think, ‘Mmm, there was a good story there,’ and give Charles Dickens a go. He’s worth it! I took ten all-time great stories and retold them in a fun way. 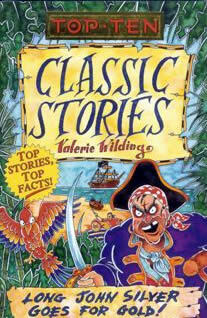 Captain Flint the parrot tells the story of Long John Silver and Treasure Island while chatting up the bird he fancies. Black Beauty tells his story to his grandsons, and Wuthering Heights becomes a dramatic picture strip story. I hope that, after enjoying these retellings and the light-hearted fact sections, readers might go on to read the original stories. These are two books in a series called ‘Pickle Hill Primary’ and they were illustrated by a very talented lady called Kelly Waldek. 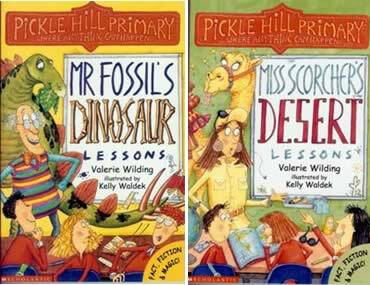 Pickle Hill is a school where anything can happen – and usually does! When Mr Fossil teaches the class about dinosaurs, his lessons really are magic – and highly exciting. And the lovely Miss Scorcher’s desert lessons are just as magical – after all, what other teacher lets you have a chat with a camel, then sends you through the cupboard door into the Sahara? This book was written for a series called ‘Speedy Reads’, and that’s exactly what it is. Packed full of information, and written in a chatty style, it’s broken up into small sections. That makes it visually appealing if you’re not keen on large chunks of unbroken text. 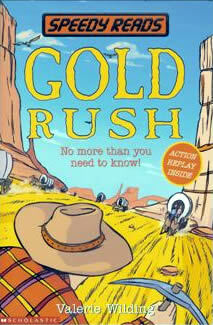 Gold Rush tells the true story of the 49ers and how they changed the face of America, for ever. Learn how they got to the gold fields, how they survived, and what they spent their money on – if they had any. 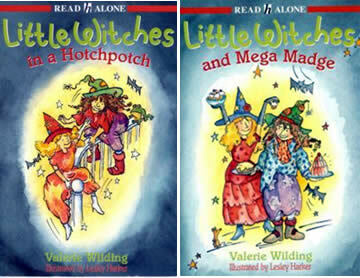 These ‘Little Witches’ stories almost wrote themselves, and I’m sure it’s because they’re such strong, determined characters. They’re called Skusting and Skwizit. I can’t easily explain the reason for their names in writing, but if I ever come to your school, I will! Skusting and Skwizit failed their witchery exams. If they need magic, they have to ask for help from Wiziwych – a computer, with attitude. 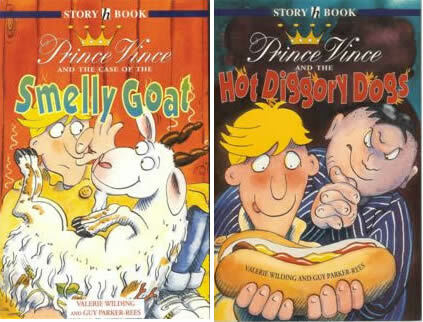 When I began the first Prince Vince book, I had little more than my main character, and his relationship with two or three minor characters. I also had my first line, which was, ‘On Wednesday, Macclesfield the butler said an unbelievably rude word in front of the Royal Family’. From that moment on I just wrote, barely stopping until I came to the end. It was a lovely experience, to write with no clear idea of where I was going, yet to end up with a very satisfying story that still makes me laugh. I’ve tried doing the same thing since, and it doesn’t work! 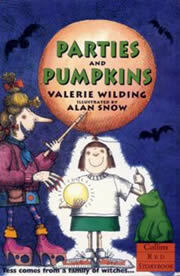 My family think I based the witches in Parties and Pumpkins on some of them. Did I? I’m not telling! Tess and her mum run PARTY P.O.P.P.E.R.S (Perfectly Organised Private Parties Every Requirement Satisfied), but Gurt Ada and the other witches of Humpty-Back Cottage (known as Humpty Dump) have their own reasons for trying to ruin everything. In Surprise, Sharon’s determined to be miserable because she can’t have a birthday party. But she’s staying with Jass, and he’s determined she’s going to have a good time, whether she likes it or not! The third book, Mould at the Hasty Tasty introduces the awful Mrs Mould and her even worse cooking. Jass’s parents are away, and she’s in charge. How on earth can Jass stop her ruining the business?